Is there anything better than a sweater dress? It’s an easy way to stay cozy while still looking cute! I find myself reaching for my sweater dresses frequently in the fall to create an effortless outfit. This option is perfectly oversized and made of the softest chunky knit. When it gets colder, I plan on pairing it with over the knee boots. It’s easy to dress up or down and will be perfect to wear to work or on the weekend. I am linking up some more sweater dress options that I am loving below! You will definitely see me style more sweater dresses this fall and winter! It’s been a long time coming, but I finally made the switch from Blogger to WordPress and so far I am loving it! I’ve been on Blogger since 2011 (how crazy is that?! Get a good laugh and check out one of my first posts here) and probably should have made the switch sooner, but as someone who doesn’t like change, I was super nervous! The team over at pipdig made the migration seamless and I could not be happier! The process was quick and they handled everything for me…something I was really stressed about! If you haven’t made the switch, I highly recommend doing so and can’t recommend pipdig enough! Monday…we meet again. I don’t know about you, but my weekend FLEW by! I feel like if the weekend was just oneee day longer, I would be more prepared to start my work week…anybody else agree? Throwing on a great pair of sunglasses is one of my favorite ways to complete an outfit when I head out the door! My Karen Walker sunnies are usually my go to, but another brand I have been eyeing lately is Retrosuperfuture. Their unique and trendy designs make for the perfect finishing touch. Who doesn’t love a great pair of sunnies? I have been obsessed with yellow lately! It’s one of my favorite colors for fall! 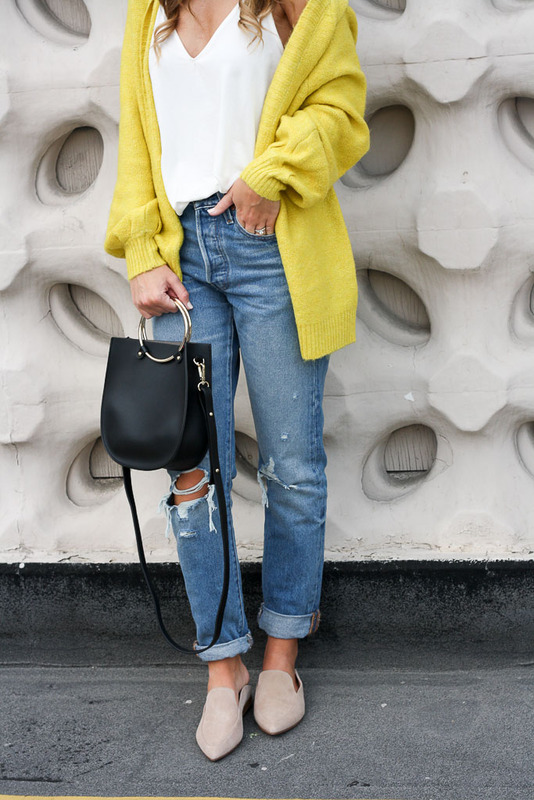 Not only is this cardi from ASOS yellow, but it is SO SOFT! I also love the fuller sleeves! Throwing on a cozy cardigan over denim and a basic tee or tank is an effortless way to stay comfy but still look cute! If you are looking for a great pair of denim, these Levis are my latest obsession. The boyfriend fit makes them SO comfortable and I love the distressing! If you follow me on Instagram, you know I’ve been all about the cozy cardigans lately! Despite the heat, it’s been cooling off in the evening and I’m finding it necessary to reach for a cardigan when heading out the door! Light-weight options are perfect for layering, providing a little warmth but not overdoing it! This cardi is the ULTIMATE light weight option! It’s incredibly soft and I love the slightly slouchy fit allowing it to be worn on or off the shoulders. It comes in a variety of colors (linked below), and I’m not going to lie…I wouldn’t mind adding them all to my closet! Is there anything better than a weekend that just keeps on going?! With the 4th of July falling on a Tuesday this year, the festivities have stretched into a long 4 day weekend and I don’t mind! I’ve spent the past two days at the lake and came home today while the husband works, but we are headed back tomorrow. I love living just 30 minutes from summer paradise! When I spotted this romper, I put it in my cart immediately! It’s been perfect for 4th of July fun and I know I will be wearing it all summer long! It’s a pretty fun little piece to add to your closet this season, especially with it’s under $25 price tag!